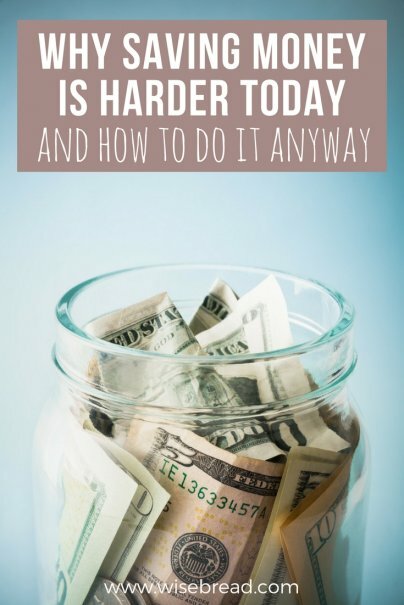 With a low overall inflation rate, and declining inflation-adjusted prices on goods such as technology and groceries, you might think that saving money today should be easier than ever. But sadly, that isn't the case. Prices of some of the biggest items in most household budgets have actually gone up faster than income has grown. Skyrocketing costs for key expenses, along with slow income growth, are making it much harder for people to save money now compared to past decades. According to data from the Bureau of Labor Statistics, the U. S. Census Bureau, and the College Board, here are some of the biggest budget-wrecking expenses that are growing faster than your income. For many families, saving for college is a huge financial challenge — especially with the rapidly increasing price tag. Building a college savings fund to cover all of the costs is more and more difficult. As a result, more students and families are turning to student loans to make college possible. The average cost for tuition, fees, room, and board at a public four-year university grew 80 percent from 1997–2016, jumping from $11,390 to $20,500. The cost of health care and health insurance has shot up in recent years. In some cases, a big medical expense can spell financial trouble: If an illness or injury keeps you out of work, the loss in income can make it even harder to bounce back from a large medical bill. Health care costs spiked 123 percent between 2000 and 2016, growing from an average $2,066 per year to $4,612. Purchasing a place to live has gotten much more expensive, with median new home prices growing from $169,000 in 2000, to $307,800 in 2016 — an increase of 82 percent. Expensive housing can result in a budget crunch in several ways. It requires a bigger down payment, which takes a lot of money away from savings at the time of purchase. Monthly mortgage payments are higher, and higher home values also result in higher property tax and homeowners insurance premiums. Higher house prices may drive people to consider renting instead of buying, but the price of renting has also gone up rapidly. The inflation-adjusted price for food has stayed flat or even gone down over the past 16 years. On average, income growth has kept up with food costs. Yet, spending on food has gone up in many households in recent years. People may be electing for more convenient — and more expensive — food choices as a consequence of working more hours to boost their income. Average food expenditures grew around 40 percent from 2000 to 2016, rising from $5,158 per year to $7,203. This cost varies significantly based on location and the type of care, but many families with young children are struggling to find affordable child care. According to a 2016 Care.com and New America report, the average cost of a full-time child care center for a child up to age four is $9,589 per year, which is more than the average cost of in-state college tuition ($9,410). Even in a dual-income household, child care can be an overwhelming expense. As budgets continue to get squeezed by growing expenses, debt levels have also increased. This can set up a vicious cycle where you have even less money available, which leads to more borrowing to make ends meet. For example, car prices have been relatively stable when adjusted for inflation, but the amount consumers are borrowing to buy cars has gone up. According to Experian, the average car loan as of 2016 stood at $30,032 with an average monthly payment of $503. Credit card balances and student loan balances are also trending upward, which means bigger payments are due every month, resulting in less money that could go toward savings or other bills. The overall economic trend is that some of the biggest expenses in many household budgets are growing much faster than income is growing, creating a squeeze that is making it harder and harder to save money. There are two basic approaches to dealing with the financial squeeze of higher expenses and limited income growth: reduce expenses or boost income (or both).